In this video, I'm going to share with five tips for getting tons of people to your blog. Are you ready for them? Lets go! First thing – you want to make sure you know exactly who your ideal target person is. Who are you trying to reach? What are their goals? What are their struggles? And lastly – how can you help them accomplish those goals and overcome those struggles? Is it that they are trying to accomplish something? Or is it simply that they are looking for a good laugh. Is that person male or female? What are they passionate about. Be clear about all of this. Secondly, once you know who that person is, create awesome content that helps them accomplish their goals and overcome their struggles. Create this content consistently and don't skimp on the quality. Make the best content you can create and do it over and over again. This is really going to set the foundation for everything you're trying to accomplish. If your content is awesome and consistent, people will be more likely to share it. Ok, now for the third part – Make strategic alliances with key people who you can help and can also help you accomplish your goals. This can be other bloggers in your niche, or even just people who you know can benefit from your content. When I first started my biology blog, I emailed a bunch of other biology websites, not to spam them or beg for help but to see how we can both help each other out. Today with my blog, I connect with people on social media and even by going to live events, and it's amazing to see what has come as a result of those connections. What's the fourth thing you can do? Pick a social network to master and use that social network to engage with your target audience and to build exposure for your blog. If you choose to use Facebook, get on there, start a page and start connecting with people. But don't just do that – take courses on how to market with Facebook and take action on everything you learn that is applicable to your business. When I started my biology blog, I decided to focus on Youtube. I took courses on Youtube and I used it effectively as a result of the training I received. Today, Youtube is one of the BIGGEST ways I get exposure for that blog. And lastly – tip #5 – Make sure your content is shareable. How do you do this? Simple – Have social sharing buttons on your blog. Use images freely and wisely so that it makes your content look good on your blog and especially when shared on social media. And lastly, make sure you have a responsive design or theme on your blog so that when people find your content on their mobile devices, they can easily share it with their networks. So those are my five tips. My question for you is this – which of these tips do you find most useful? Let me know in the comments below. Hey Leslie, I totally this site. The content been super helpful. My favorite points of the video were…. -Form strategic alliances with people in your field. My big question is, what approach would you recommend to go about accurately understanding/ defining my target audience? I would start by just brainstorming. Who do YOU want to reach? What do you know about that person? I find that many times that person is an early version of ourselves. As your audience grows, you can get even more specific details by surveying them to figure out who you’re reaching. But in the beginning, it’s a little bit of a stab in the dark until you get to know them in detail. Really nice site….i love this site.. Thanks for your Article.for a new blogger these informartions can be very useful for generating the traffic.and there are more aspects like strategies making and targeting the goal ,very important part for the bloggers. I believe in B2B marketing, it doesn’t matter whether your targeted audience is a male or a female. the only thing to consider is what they want and why they are there and what you want from them to accomplish for and are you fulfilling the needful. One of the best traffic provider is social media. You really have to master one or few of them. 1) My blog showcases my fiction writing skills – so what other advice/tips would you have for driving traffic as a lot of tips tend to be geared towards “how to” informational websites/blogs? 2) I was thinking of adding informative writing on that particular topic on that same blog but would the mixture of fiction and informative writing actually be detrimental and add to reader’s confusion? Would it be better to have two blogs then? 3) How important is the design of a website? I am quite a literal person and find myself floundering in the design aspect of my blog and was thinking if it is better to pay someone to design it or just sticking to a basic wordpress template would suffice? 1. 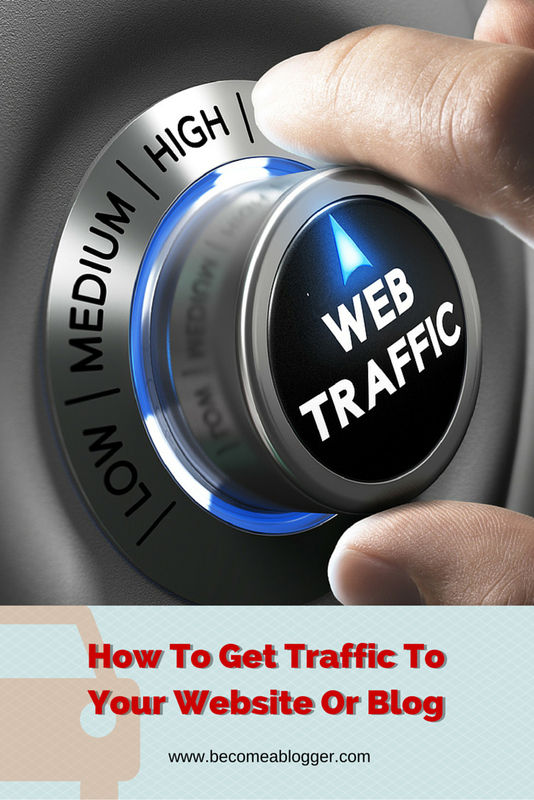 The principles for driving traffic are pretty consistent. Create awesome content and get it in front of the right people. Provide tons of value. If you think about the problems your audience has, and solve that in a clear way, people will want to keep coming back. There’s so much more I can say on this, but it’s too much for a comment. 2. Never better to have 2 blogs. One takes A LOT of work. Focus! 3. Design is important, but not important enough to hold you back. Just get a nice WordPress theme from a site like Elegant Themes and you are good to go. I love the idea of a focused push on just one social website. We will definitely implement that plan. Thanks for the idea.